1. 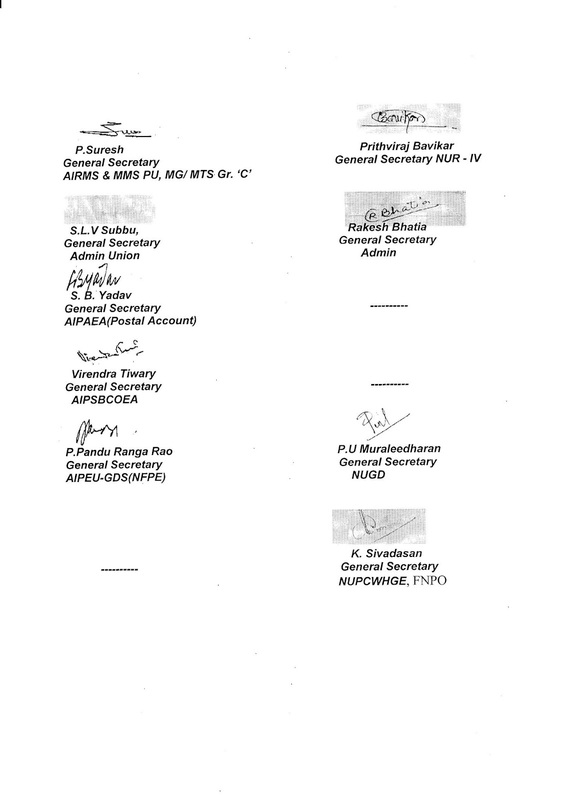 Implement all positive recommendations of Sri Kamlesh Chandra Committee report and grant Civil servant Status to GDS. 2. Fill up all Vacant Posts in all cadres of Deptt of Post i.e P.A/S.A, Postmen, Mail Guard , Mailmen, MMS, MTS, GDS, Postal Acctts, P.A Admn Offices, P.A SBCO & Civil Wing etc within a time frame and separate identity of all cadres. 3. Settle all the problems arisen out of implementation of C.S.I & R.I.C.T. 4. Withdraw NPS and Guarantee minimum pension 50% of last pay drawn. 5. Membership verification of G.D.S and declaration of result of regular employees membership verification conducted in 2015. 6. Implementation of orders of payment of revised wages and arrears to the casual , Part time, Contingent employees & daily rated mazdoors as per 6th and 7th CPC and Regularize Services of casual Labourers. 7. Implement Cadre Restructuring for left out categories i.e RMS, MMS, Postman/MTS, PACO, PASBCO, Postal Acctts, Postmaster Cadre and Civil Wing etc. 8. 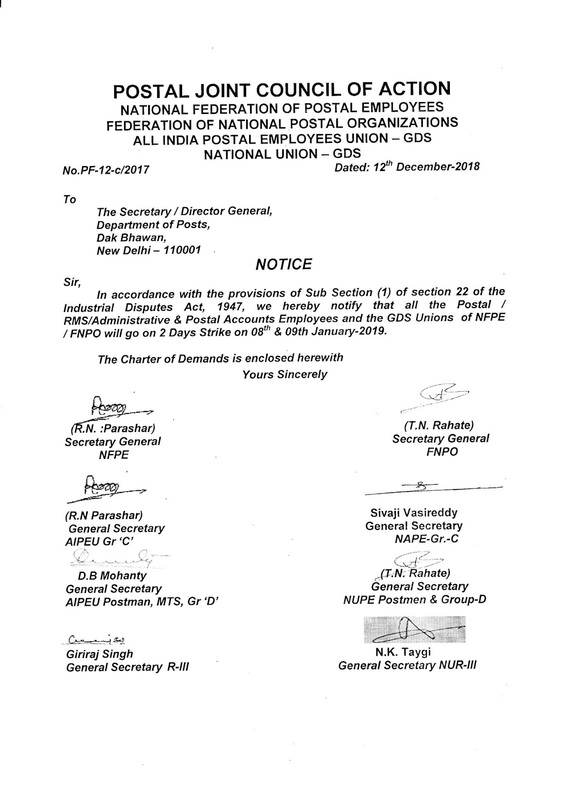 Stop Privatization, Corporatization and out sourcing in Postal Services. 9. Scrap Bench Mark in MACP . 11. Enhancement of higher pay scales to those categories whose minimum qualification has been enhanced e.g Postmen, Mail guard. 13. Withdraw orders of enhancement of cash conyance limit without security. 14. Implement all High Court and Supreme Court decisions in C/W MACP, RTP and others. 16. Retention of Civil wing in the Deptt of Post. 17. Holding of Deptt Council Meetings and periodical meetings at all levesl. 18. Stop Trade Union victimization and in the name of unscientific targets. 19. Provide 40 percent SCF quota promotion in AAO cadre and amend RR incorporating the modifications demanded by AIPAEA. 20. Status of audit to SBCO. 21. Restore Special Allowance to PO & RMS Accountants and OSA to RMS/MMS Staff. 22. All NSH and I.C. Speed Post Hubs should be under the administrative control of RMS and All L-2 Mail Offices should be identified as I.C. Speed Post Hubs and as Parcel Hubs. 23. Permission to all Staff of Circle Office, Postmaster Cadre, SBCO, Postal Accounts and RMS/MMS Staff to appear in Departmental Examination for promotion to PSS Group-B. 8. Stoppage of Contractorisation in permanent /perennial work and payment of same wage and benefits for contract workers as that of regular workers for the same and similar work. 10. 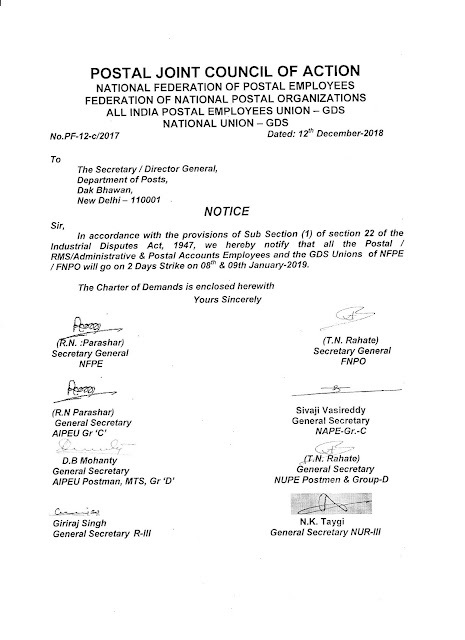 Compulsory registration of trade unions within a period of 45 days from the date of submission application and immediate ratification of ILO conventions C-87 & C-98. 11. No FDI in Railways, Defense and other strategic sectors.